Amanda Lancaster | Alutiiq Museum Nov 28, 2018. With a $1,000 grant from Museums Alaska the Alutiiq Museum will purchase an original watercolor painting by Alutiiq artist Cheryl Lacy. 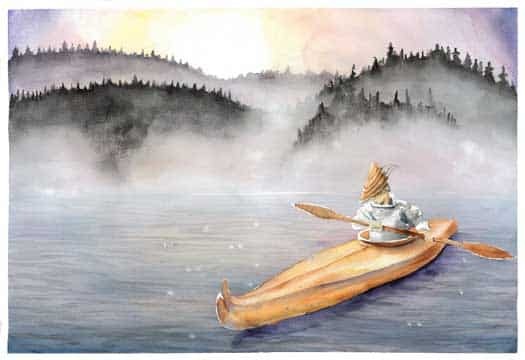 Misty Morning depicts a man in a traditional kayak paddling along a forested coast. Behind him are the dark silhouettes of spruce-covered hills and the pastel colors of sunrise. The painting displays the artist’s talent at creating depth and atmosphere using colors and shading. She even captures drops of water dripping from the paddle. According to Lacy her art “reflects the journey to learn more about myself, where I came from, and introduce people to Alaska Native culture.” Her favorite mediums are pencil, pen, charcoal, watercolors, and acrylics. She also likes to make pictures out of non-traditional materials, including beads and found objects. The Alutiiq Museum has three of Lacy’s beaded art pieces. Misty Morning is the first of her paintings to be added to the collection. Support for this purchase comes from the Art Acquisition Fund. Established by Rasmuson Foundation in 2003, and administered by Museums Alaska, the fund promotes the development of contemporary art collections in Alaska museums. Each year, the fund invites proposals to purchase the work of living Alaskan artists, made within the past five years. Since the fund’s inception in 2003, the Alutiiq Museum has received $204,953.50 in grants to purchase 134 works by 40 artists. These pieces can be enjoyed in the contemporary art gallery on the Alutiiq Museum’s website. Museums Alaska will offer three opportunities for museums to apply for purchase funds in 2019. The Alutiiq Museum is currently inviting artist to submit purchase proposals for the next round of grants. Proposals are due to Collections Manager Amanda Lancaster by Monday, January 28th, 2019. Additional details are available on the museum’s website.